So, Fiji. I am enamored. We are in Suva, the capital city. It is on a bit of a peninsula, and a cool sea breeze blows all day long. The light has a different quality here-- somehow things have more contrast, more clarity. At first there was something about the light that puzzled me, until I remembered that the sun appears to be moving in a different direction than I am used to because we are below the equator. 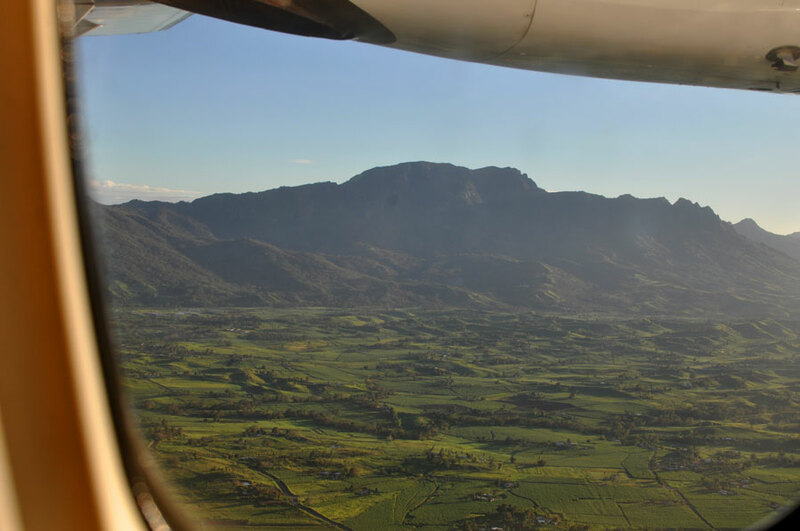 We flew into Nadi, then took a smaller plane across the country. The interior of Fiji is a continuous roll of mountains, starting out brown and then becoming green and jungley. 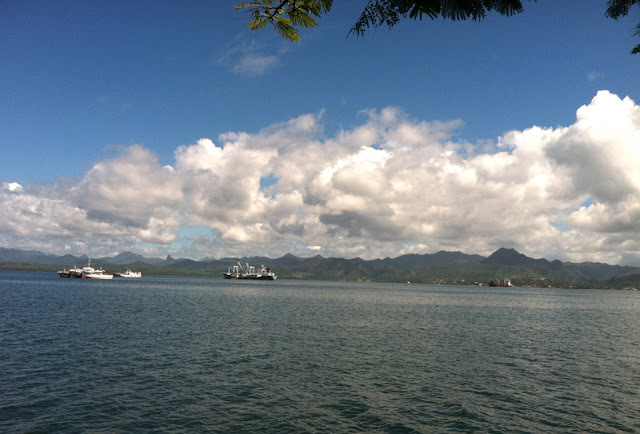 Suva is ringed by more mountains, and slopes down to the harbor where huge ships and smaller fishing boats dock. 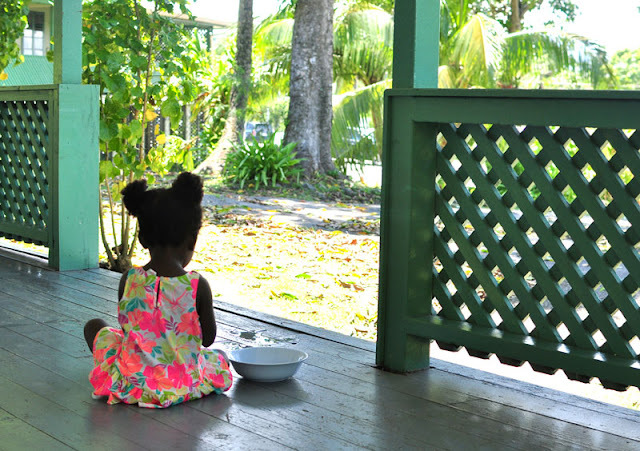 There are a lot of similarities to Belize-- Fiji is also a former British colony-- so the architecture feels very familiar. Schools are built the same, the school children all wear uniforms, the trees and plants are the same. It was quite disorienting driving from the airport, seeing so much that looked familiar, yet driving on the “wrong” side of the road. Also, lots of men wear sulus-- which are basically wrap skirts. Still getting used to that. We are incredibly lucky to have a nice place to stay. It is within a few blocks of a lot of shops (including a store which is like a Costco and a McDonalds… such a different world). Also, we have hot water and AIR CONDITIONING. Basically, this is a luxury resort for us. It’s amazing how well you can cope with the heat and humidity when you know there is a nice cool bedroom you can retreat to. And the heat and humidity can be overwhelming-- it has been around 90-95 degrees daily, with similar humidity. We missed a few weeks of the semester, but it worked out the best for us, since Fiji was hit by a category 5 typhoon a few weeks ago. Suva did not get a lot of damage comparatively, but there still was near 200 mile per hour winds, trees down, roofs off, and no electricity. Parts of the country were completely flattened. Here in Suva, you can see spaces where huge trees were knocked down, but other than that you would never know such a huge storm recently hit. It would have been very, very scary to have been here during the typhoon with the 2 girls. We are still dealing with rolling electricity and water outages, which can be frustrating, but since parts of the country still haven’t had electricity restored since the typhoon we can’t complain. The University campus is really incredible. It is quite large, and paths and bridges wind through huge, vine covered trees. Palms, oversize ferns and lots of really large bats flying around during the day make it seem like a prehistoric jungle. The buildings are architecturally very interesting, with lots of tropical influences. Daniel is one of only a few students in his class, and he is enjoying it, although he is working non-stop to make up for the 3 weeks he missed. The semester is being held here in Fiji because there are a lot of industrial farms, and the class will go on field trips to visit. I’m quite jealous Daniel will get to see so much of the country! Internet here is very intermittent, and I've been slow to take out my nice camera because I'm mostly hauling around both girls and don't have an extra hand. But I've got lots to share, so hopefully I'll be able to post again soon! Bula! (that’s hello) We made it, we are in Fiji and it is glorious! Before I get to the awesomeness that is Fiji, though, I have to document our trip here. It was EPIC, in a very Homererian shipwreck-Cyclops-angry sirens way. 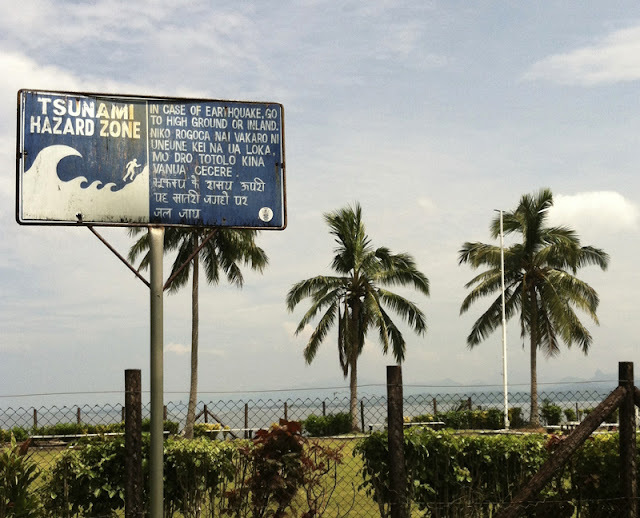 On Monday, we heard that our long-awaited Fiji visa was ready. Since Daniel’s flight is part of his scholarship, we had to wait for the coordinators to source his flight, and then pray that the girls and I would be able to buy tickets for the same itinerary. On Thursday, Daniel was told they wanted to fly him out that Sunday. At about 10pm that night, Daniel was sent a flight itinerary, and we noticed the university was working with a travel agent to source the flight. 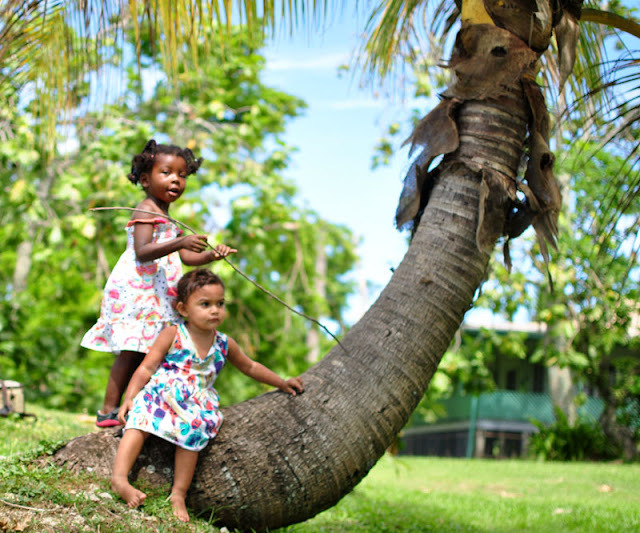 We quickly emailed and asked if we could work with the same Fijian travel agent to get flights for me and the girls. At 1am Friday morning, after multiple phone calls and emails to Fiji, we were successfully booked on the same flights Sunday. And the itinerary was perfect: direct Belize to LA, and then overnight LA to Fiji. About 24 hours travel time for us. At this point, it was Friday in Belize and Saturday in Fiji. Everything was set for Sunday….. Only no one had ever sent us a copy of our visa. We spent Friday and Saturday trying to get in touch with someone to send it, but since it was the weekend, no one was in. We decided there wasn’t much to do but cross our fingers and go. Sunday morning around 5am (after I got about 2 hours sleep-- seriously, where do allll those odds and ends in a house come from? Impossible to be “finished” packing) we set out for the airport. The trip was uneventful until about 5 minutes from the airport, when Lu projectile vomited all over me and herself. No problem, I’d packed a few changes in the carry on. At the (automatic) check in, we perplexed the kiosk since I was traveling on my US passport, the girls on Belize, and Daniel on his British passport. When an agent came over, she asked to see Daniel’s ESTA waiver. UMMM….. Oops. I had completely forgotten about that. Since he is British he doesn’t need a visa to travel through the States, but a few years ago they started requiring an online check and small fee that has to be done before travel. Thank goodness for technology, cause I got out my computer and credit card, hooked up to airport wireless, and 15 minutes later, we were good to go (although my hands were shaking so much I could hardly type). They ticketed us all the way through Fiji without asking about a visa! We actually have applied for Samoa visas, but did not have it yet, and anyways, why the heck would they need to see our Samoa visas when we would be flying there 4 months from now? How is it not enough that we have proof we are leaving Fiji? It was approaching 8:30, the counter closed at 9, and Daniel at this point was ready to scrap the whole thing and go back to Belize. I asked him to please go back and talk to one supervisor who was sympathetic, and find out if there is any flight we can buy that will fulfill their requirements and be less than the $1,200 US per person that the unneeded return ticket to Belize would cost. And LO, he had an idea. Buy ongoing tickets to Samoa, then further tickets to Western Samoa, which is a US territory and therefore we do not need / already have visas for. And so, with very shaking fingers, using the last 9% charge on my computer, we bought those magical tickets to Western Samoa , showed the confirmation email to the agents, and they printed out our boarding passes. We went straight through security and boarded at 9:45 pm. The girls slept the entire 11 hour flight. It was with much trepidation we approached the immigration agent at the international airport in Fiji, because the LA gate agents had regaled us with stories of travelers without proof of visas being locked in a room and than deported. “Do you have a visa,” the agent asked without looking up at us. “Yes….,” we tentatively said. She waived us past. Stunned, I (stupidly) said, “um, do you need to see it?” “Nope.” And we walked on by. 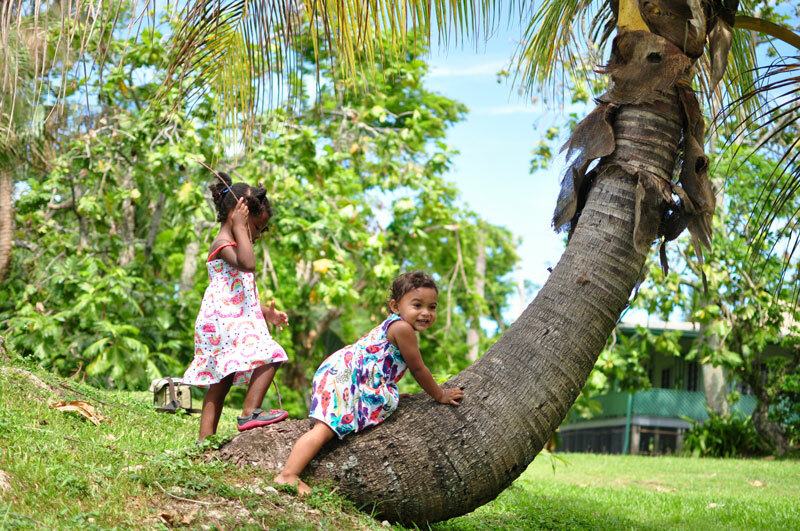 So now the girls and I have one-way tickets to Western Samoa, and a horror of the LA international airport that will take a loooooong time to fade.